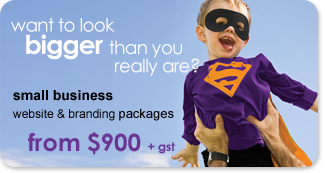 We have put together a number of different packages to give you a great start or a fresh new look for your business. Our packages include a combination of our services in web design, logo/branding services, or both. By combining our services, we can save you money. Some of our web packages also include domain name registration, web hosting and search engine submission services. Please note these packages are just an indication of how we can bundle our web, logo and/or graphic design services to save you money. If these packages do not suit your exact requirements, please speak to us and we will tailor a package to suit your needs.